Serinytex (pronounced sah-rhen-ahtex) is a psychiatrist formulated supplement designed to support a restful night sleep. It is a synergistic blend of herbs, amino acids and melatonin. Serinytex encourages sleep hygiene, exercise and a balanced nutritional diet to promote optimal health. Sleep disorders are vastly underreported, and there are likely many more than 70 million Americans who are not getting adequate sleep. Only a third of Americans get the recommended 7 to 9 hours of sleep a night. An estimated 30%-50% of the general population is affected by insomnia, and 10% have chronic insomnia. Insomnia affects all age groups. WHY SLEEP IS VITAL TO LIFE LONGEVITY the University of Warwick did a study and they found that getting less than 6 hours of sleep on a continuous basis makes you 48% more likely to die of heart disease and 15% more likely in developing a stroke. In fact, the trend for late nights and early mornings is like a "ticking time bomb for your health”. If you are over 65, you are 83% more likely to have high blood pressure which increases the risk of heart attack and stroke. WHY SLEEP IS IMPORTANT IN IMMUNITY The immune system functions best when it gets enough sleep. Seven or more hours of sleep is recommended for optimal health. The fact is the more sleep deprived you are more likely to get sick and the more likely you are to decrease your body’s ability to respond to colds or bacterial infections. 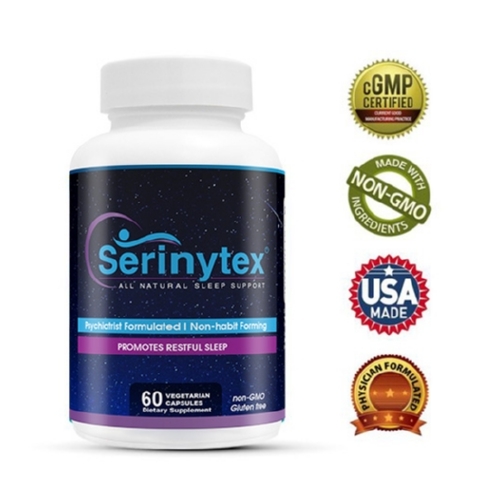 Among adults, insomnia affects women more often than men in the event you desire an all-natural complementary option to support a restful night’s sleep, Serinytex is for you! Supplement Summary: Promotes Restful Sleep, Ingredients (Passion Flower Extract, Valerian Root, L-Theanine, Melatonin, Glycine, Lemon Balm Extract,) Non-Habit Forming. Vegetarian Capsules. Directions: Take 1 or 3 capsules 30 minutes before bed for sleep support. Do not exceed 3 capsules within 24-hour period. May consume with a cup of chamomile or lavender tea of your choice. Caution: Do not combine with other sedatives, alcohol or sleeping pills. Do not attempt to drive or operate heavy machinery after consumption. Not for use in children pregnancy or nursing women. Stop use and consult your doctor if any adverse reactions occur.